Many laptops and almost all web-cameras are equipped with built-in microphones, but if you try to create a podcast, or to record a demo of your songs, you need a device with a much better sound quality. Here the USB microphone comes to the aid. When you purchase a USB microphone, it is necessary to pay attention not only to its price, but also on the sound characteristics. From this, the quality of recording sound will depend on. 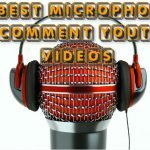 Here is the top of 15 best USB microphones in 2017. 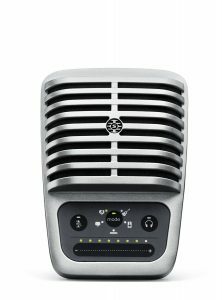 BEHRINGER ULM100-USB – is a practical and convenient wireless vocal radio system with USB interface. The structure includes a radio hand-held transmitter and USB-receiver. The compact receiver is a USB adapter that can be connected to any computer (PC, Mac) or other equipment with a USB port. Thus, the sound can be transferred directly to a computer, including performing recording while avoiding the inconvenience of connecting cables. The microphone of this radio system is powered by two AA batteries, which is enough for 8 hours of continuous operation. This microphone is able to transmit stably a signal over a distance up to 120 meters in a line of sight. To save power consumption when you turn off the microphone the adapter will automatically go into sleep mode, which helps to preserve battery power for longer use. The receiver is connected to the USB port and does not require an additional power source, feeding directly from the device to which it is connected. Setting of the radio system is simple, convenient and intuitive. The connection between transmitter and receiver is set automatically. The microphone adapter and USB are equipped with indicators of activity that light up when the transmitter is coupled with the receiver. On the microphone there is also a low battery indicator, warning of their imminent discharge. The volume level is adjusted by means of two buttons, Volume Up and Down, and the function of Panic Mute (Mute the sound) will be included in the case of long pressing of the Volume Down button. The frequency range of the radio is from 20 Hz to 15,000 Hz. Dynamic range is more than 67 dB. ULM100USB for radio transmission is using the 2.4 GHz band (2417-2471 MHz). These frequencies are not reserved for any communication systems, in connection with which there is no interference problems. To transfer, you can choose one of the 19 channels. When connecting the radio to the computer, you can record directly into the DAW. Also ULM100USB can be connected, for example, to mixers, or some of the active audio system models equipped with a USB connector that allows you to edit the incoming signal from the microphone and create arrangements of varying complexity in real time. Sampling frequency of the transmitted radio signal is 31.25 kHz to provide high-quality sound, which can be used successfully for the creation of electronic mixes. Sound delaying when using this radio systems is no more than 9 ms. The microphone is presented in black, it is characterized by simple, strong and durable design. USB radio adapter has a size of no more than an ordinary stick. The compact and convenient form of microphone dimensions should be noted (length – 24.5 cm, diameter – 4.5 cm), and the small weight of the system – only 200 grams. Operating distance from the receiver to the transmitter: up to 120 m in the line of sight. Radio frequency range: 2.4 GHz (2417-2471 MHz). The number of available channels 19. The range of audio frequencies from 20 hertz to hertz 15,000. Dynamic range: more than 67 dB. Output signal power: +17 dBm (50 mW). Delay: not more than 9 ms. Microphone power: AA 1.5V battery type B; 160 mA, 2.7 V, 140 mA, 3V. The power of USB adapter: from the connected device; @ 100 mA +5. Battery life: up to 8 hours. Indication: activity indicators, low battery. Controls: volume control (Up, Down), function Panic Mute. 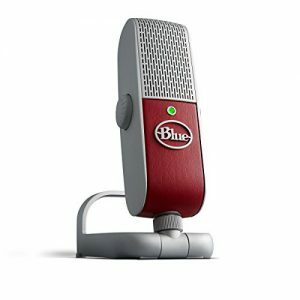 The top USB microphone of an American company Blue Microphones became the world’s first device of this class, which is able to record sound with a frequency of 192 kHz and 24 bit. On this the innovative possibilities are not limited. In the microphone just three condenser capsule are installed, allowing to select one of four modes (stereo, cardioid, omnidirectional or figure eight), providing different radiation pattern. The XLR analog output is complementing it for the use of Yeti Pro in paire with a mixer or external DAC. Device controls are presented by buttons Mute and Gain, the mode selector and the volume control on the stereo headphones are supplied. Possibility of hardware monitoring is also presented. It comes with a handy table base, a holder for mounting on a stand and a USB cable. The quality of rented sound and a conversion of a built-in converter are comparable with studio ones. 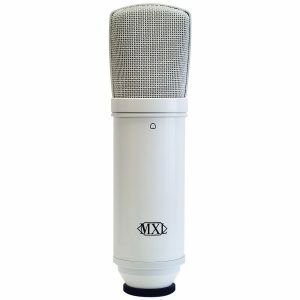 MXL DRK USB – is a fully self-contained condenser microphone with phantom power or battery-powered, which provides unparalleled quality of records. It is great when recording of vocals, instruments, OB work, recording of podcasts, announcer reading. Bottom border of frequency range: 30 Hz. The upper border of frequency range: 20 000 Hz. Sensitivity: 10 mV / Pa.
Max. level of sound pressure (SPL): 134 dB. Power: 48V ± 4V (or 9V). AT2020USBi is a condenser microphone with USB interface. Developers have reported that the new product provides high-quality recording on devices running on Windows and Mac. In addition, the microphone is perfect for working with gadgets on the latest version of iOS (iPhone, iPod Touch, iPad). The device is designed for recording in an open area, and to work in home studio. AT2020USBi is great for voice-over sound and podcasting. digital output, providing the most convenient entry. Frequency range 0.02 … 20 kHz. Sampling frequency to 96000 Hz. DC power supply, V 5 with a USB 3.3 or by Lightning-cable. it features one of the largest aperture (25 mm), which is available in condenser microphone with a USB interface. Signal / noise ratio: 96 dB (A), 120 dB max. Analog output for headphones 1/8 TRS Jack. 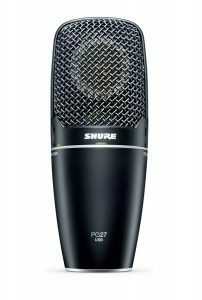 SHURE PG27USB is a USB cardioid condenser microphone with a large diaphragm. 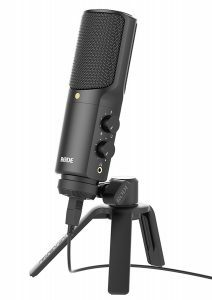 A well-known American manufacturer, the SHURE company, presents a high-quality condenser microphone SHURE PG27USB. All models from this manufacturer of microphones are incredibly popular, due to the high quality of sound of vocals or musical instrument. It can be easily connected to a PC via USB-port. The direction of the microphone: cardioid directivity, unidirectional. Microphone housing: special steel alloy. Operating frequency: 20 (Hz) to 20000 (Hz). Protective grid of membrane: steel grating. SHURE MV51 is a digital condenser microphone with USB-connection in vintage style with a large diaphragm from the microphones of Motiv line. The microphone is designed to work with your computer and mobile devices. Universal built-in stand of dual purpose – for desktop use and the adapter with 5/8 “thread for mounting on a stand. For home recording studio, audio recording during video conferencing. Compatible with PC and MAC, mobile iOS and Android devices. 5 preset modes: speech, singing, quiet and acoustic music (acoustic instruments), loud music, and the group without treatment. The ability to monitor the recorded signal via the headphone output. Analog-to-Digital Converter: 16/24 bit – 44.1 / 48 kHz. Frequency response: 20 Hz – 20 kHz. Gain adjustment range: 0 … + 36 dB. The maximum level of sound pressure 130 dB. Headphone output: 1/8 “(3.5 mm). Power supply: via USB cable. 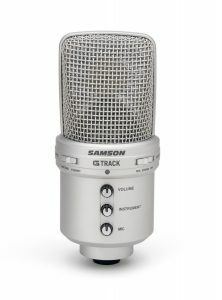 G-Track USB – is an integrated USB condenser microphone with a built-in interface for recording and mixer. It is possible to simultaneously use a guitar / vocals and bass / keys and monitor by connecting to the headphone output. Provided indicator LED of overload signal, regulator of signal level mic / line, stereo inputs for instruments / line signal, and a stereo input for headphone (monitoring without delay) with the controller and the switch mono / stereo / regulator. Power is via USB. 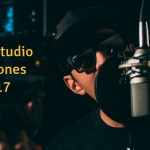 Thanks to the portability and simplicity of the use, the microphone is useful in project studio as well as in mobile use at concerts, trips and travels. Sound pressure up to 132 dB. The sensitivity of -40 dB / Pa. The frequencies: 20-16 000 Hz. The sampling rate: 48 kHz. The kit includes a tabletop stand, mount, USB cable, wire connectors 1/4 inch and RCA connection for instruments. Condenser studio microphone C01U USB is equipped with a USB interface. The model is suitable for recording vocals or acoustic instruments. Supports direct (with no direct box) connection to your PC / Mac and works with any audio software. The microphone is designed for mobile musicians, journalists, podcasters, and audio students who add sound in their presentations. Maximum sound pressure 136 dB. The size of the aperture 19 mm. The frequencies: 20-18 000 Hz. Sampling rates: 48 kHz; 8Hz; 22.05 kHz; 44.1 kHz and 11.025 kHz. The kit includes a USB cable, stand and software Cakewalk Sonar LE sequencer. It consumes 26 mA and in standby mode – only 0.3 mA. Set Avid Vocal Studio includes a USB-condenser microphone of M-Audio Producer USB. 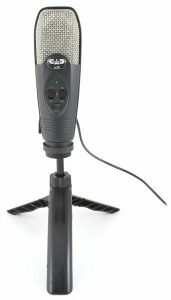 The condenser USB microphone requires no additional equipment. Inside it there is a built-in phantom power generator, preamplifier and sound card. The microphone has a traditional shape. On the front sidethere is a headphone jack for direct monitoring records. Here there is also the blue LED, which indicates the operation of the device. Directivity pattern does not change, only the cardioid. All parts of the microphone are completely metallic, it is a robust design. It comes with leatherette cover, miniature metal desktop stand, CD with drivers and software Pro Tools SE, short printed manual. 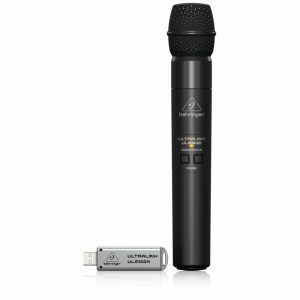 This microphone has a 16-mm cap, rugged metal housing, 1/8 “stereo output, the USB-connector and supports recording in 16-bit 44.1 / 48 kHz. Recording in 16 bit 44.1 / 48 kHz. Sensitivity: -48 dB corresponds to 1 / Pa.
1/8 “stereo headphone monitoring without delay. Pro Tools SE is included. Windows support (ASIO, WDM) and Mac. The microphone is sensitive enough. The diagram is cardioid, the sound from the working computer in the dead zone does not hit the post. The table stand is pretty good, the microphone is attached securely and steadily and stands on rubber feet. Vocal Studio Microphone is suitable for recording high-quality voice, mobile or home recording. Construction is steel, reliable, does not require any extra cords and sound cards. This set is an inexpensive complete set of creative, the first step towards a professional recording. The model of USB-condenser microphone Raspberry is compatible with devices on iOS and PC on Windows / Mac. The controller gain with Mute and a headphone output (have the volume control) for monitoring are provided. It allows you to record with a resolution up to 24 bit / 48 kHz. 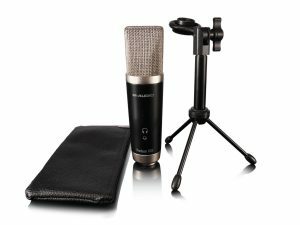 The microphone is suitable for creating podcasts and audio in YouTube videos, voice narration, recording instruments and vocals. Due to the technology IAD (Internal Acoustic Diffuser) the background noise is reduced to a minimum, and a foldable stand with a removable shock-absorbing feet allows to protect the microphone from the surface vibration. In addition, the stand provides additional protection of the device during transportation. The frequencies: 20-20 000 Hz. Electret condenser capsule measuring 14 mm. Sound pressure up to 120 dB. Gain is adjusted in the range of 0-40 dB. Attached suede pouch, a tripod adapter, USB cable and Lightning. Weight 272.3 grams (with stand). Simple and affordable condenser microphone manufactured by the American company Nady Systems, has become famous in their time so that their products are actively used Mick Jagger. 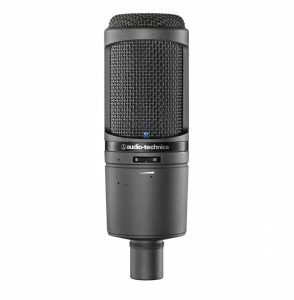 The device is ideal for novice singers and podcasters, offering good recording quality for a reasonable price. The designer uses a DAC AKM AK5371, which supports 16-bit resolution 44/48 kHz. Controls, the ability of the hardware monitoring and support are not available, but only 3-meter USB cable is bundled. The issue of placing is solved by the acquisition of an additional floor or table stands, and monitoring can be arranged via the software, however, with some delay in the region of 0.5 seconds. Sensitivity: 18 mV / Pa. Frequency range: 20 Hz – 20 kHz. Included: cable length of 3 m.
This is a product of American company CAD Audio, which is producing high-quality microphones for more than 85 years . U39 for a little money will allow you to get a full-fledged device for voice recording, vocals or instruments, just connected to USB-interface. Bit rate and sampling frequency in the machine are all the same 16-bit 44/48 kHz, but opportunities are slightly wider. In addition to hardware monitoring with volume control, implemented with the help of corporate chip TrakMix, the microphone is equipped with a cut filter of low frequencies, overload indicator and power button. It comes with a handy tabletop tripod, bracket for installation on a rack, and a three-meter long USB-cable. compatible operating systems: Windows and Mac OS. RODE is an Australian company which is a leader in the manufacture of condenser microphones and has a wide range of products to solve any problems. Among them, there is a model with built-in DAC for recording audio directly into your computer. NT-USB confidently claims to be the best price / performance ratio in its price segment, offering excellent sound transmission and opportunities. The device is compatible with PC, MAC or iOS and supports 16 bits and the frequency of 44/48 kHz. For your convenience, the headphone output is provided, also there are overload indicator and two regulators, one of which is responsible for the volume of sound coming from the capsule, and the second allows you to set the mix between hardware and software monitoring. In addition to the desk stand, a fastened pop-filter is provided and there is the USB-cable of 6 meters length. 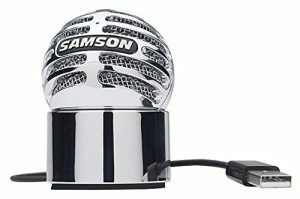 Samson Meteorite is a USB microphone that would be the perfect solution for your home computer or laptop. The microphone allows you to record voice, and get good sound when using popular software for voice communication on the Internet. This model will be a good acquisition for recording podcasts, voice recordings to the video channels on the Internet, on the road, where it is required to record or dictate text in good quality. The design uses the microphone membrane with a diameter of 14 mm, the microphone directivity is cardioid, that allows you to take the speaker’s voice quality without background noise. 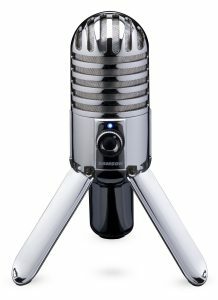 Beautiful body and chrome finish make this microphone a beautiful accessory on your desktop. Using a proprietary software SAMSON Sound Deck Noise Cancellation, users will be able to produce high quality recording in almost any location. With a cable support and a USB connector, the microphone can be connected to a laptop or PC. The microphone is automatically detected in modern operating systems, Mac OS X and Windows. With a set of Camera Connection Kit (30-pin) or Apple Lightning USB Camera Adapter, users can also use the microphone with their mobile devices for recording podcasts, etc. Microphone frequency range is 20 Hz -. 20 kHz, weight – 118 grams.